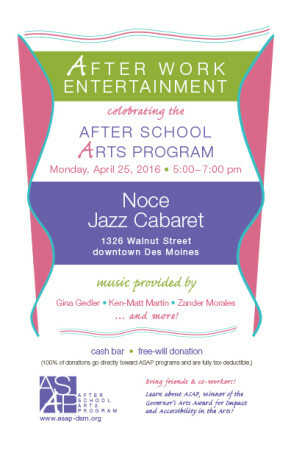 Gather your friends and co-workers, and stop by after work on Monday, April 25, from 5:00 to 7:00 pm at Noce Jazz Cabaret, 1326 Walnut, Downtown Des Moines. Hear live music performances by a steller line-up including Gina Gedler, Ken-Matt Martin, and Zander Morales in Des Moines’ newest jazz venue! Light snacks will be served, and a cash bar is available. All free-will donations go directly toward ASAP programs and are fully tax-deductible!